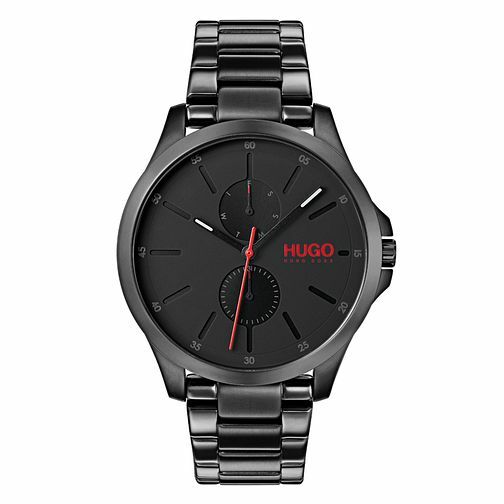 This modern mens multifunctional JUMP watch by HUGO, features a black IP stainless steel bracelet and 41mm black IP stainless steel case with matt black dial. The dial is complete with day, date function and signature logo in red at 3. It is water resistant to 30m and comes with a 2 year international warranty. Hugo Jump Men's Black IP Stainless Steel Bracelet Watch is rated 5.0 out of 5 by 8. Rated 5 out of 5 by Anonymous from Watch Looked the exact same on the photo when I went to order the product. Quick delivery and looks really good. Good price aswell for the product I ordered. Thanks guys I have one happy boyfriend. Rated 5 out of 5 by Anonymous from Boss watch I bought this watch for my son and he loves it. The quality is very good and striking to look at. It was too big and we took it to the shop who were extremely good altering it to fit without any problems. It’s a good time keeper and looks amazing job done.